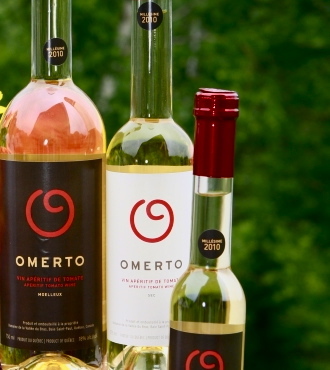 Quebec-based farmer Pascal Miche is enjoying thriving sales of his Omerto tomato wine in Canada, crafted from a secret family recipe. According to AFP, the former butcher has sold over 65,000 bottles of tomato wine since launching it onto the Canadian market two years ago. Miche makes the wine from 6,200 tomato plants on his “vineyard” in Charlevoix, 400km northeast of Montreal. “I wanted to finish what my great-grandfather had started in Belgium in the ’30s,” he told AFP. Miche immigrated to Quebec from Belgium seven years ago and started planting red, yellow and black tomatoes in Charlevoix in 2009. The crop set to ripen by mid-August will be his third harvest, with the journey from field to bottle taking around nine months. Before making his first batch, Miche tested 16 varieties of tomatoes in order to find six that grew well in Quebec’s cool climate. He can legally call his product “wine” in North America, but will have to rename it if he starts exporting it to France, where only alcoholic beverages made from fermented grape juice can be called wine.